What a fantastic weekend on the PGA Tour as we hit on our best bet of the weekend, Rory McIlroy to win The Players Championship, at odds of $12. We'll be taking a one week break from golf tips next week as many of the top players in the world prepare for the Masters just a few weeks after. This week the tour heads to Copperhead Course in Palm Harbor, Florida for the annuel Valspar Championship. We preview all of the weekend's action and give our betting tips below! Englishman Paul Casey will be back in 2019 to defend his title at Copperhead Course and will be joined by a fairly strong field, especially considering the amount of top line players competed at The Players Championship on the weekend. Innisbrook Resort in Palm Harbor is home to the Copperhead Course, a 7,340 yard, par 71 course designed by Larry Packard. Unlike many of the courses on the Florida swing of the PGA Tour, the Copperhead Course offers a contrary visual and physical layout with rolling terrain and heavily tree lined holes. The course is long, especially with double-doglegs on two of the par 5's. Driving distance and accuracy will be at a premium this weekend. The signature stretch of holes at Copperhead is aptly named the 'Snake Pit' which sees two extremely tough par 4's on either side of the 215 yard par three 17th which will most certainly make or break some rounds this weekend. Irishman Padraig Harrington holds the course record of 61, achieved back in 2012. 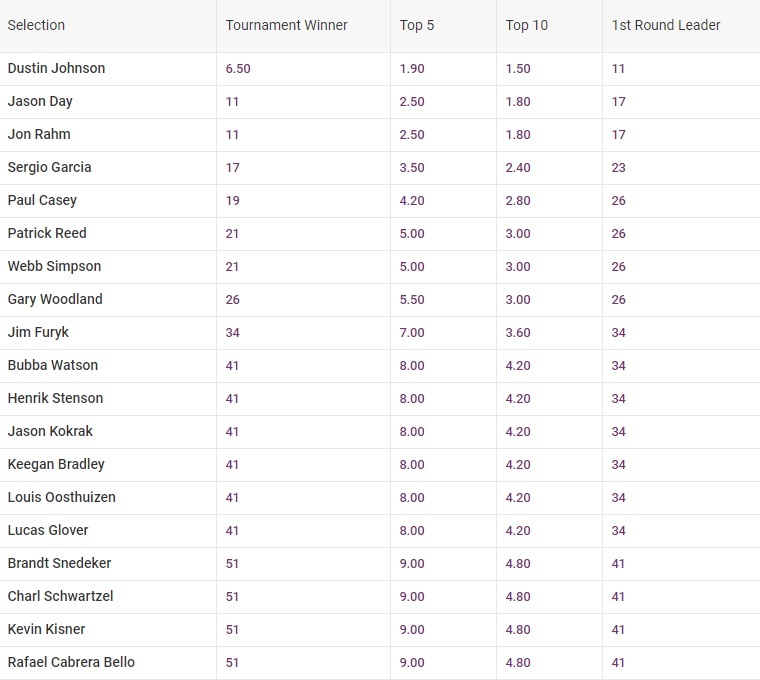 The No.1 ranked golfer in the world, Dustin Johnson, will headline a fairly stacked Valspar Open field this weekend, along with a few more top ranked players. Spaniard Jon Rahm will look to bounce back from a disappointing finish to The Players Championship on the weekend while Englishman Tommy Fleetwood will be hunting that first PGA Tour victory after leading both the Arnold Palmer Invitational and The Players at stages over the last two weekends. Winners from the last five seasons come from five different nations and all of them look set to start at Copperhead this weekend in John Senden (2014), Jordan Spieth (2015), Charl Schwartzel (2016), Adam Hadwin (2017) and Paul Casey (2018). As we mentioned above, driving distance and accuracy are at a premium this weekend, which makes it incredibly tough to seperate Jon Rahm and Dustin Johnson at the top of the pile. As the first and second favourite to win the touranment, however, there's not much value in either so we'll be looking a bit further down the board for some value this weekend. American Keegan Bradley has been in great form of late and represents some good value this weekend at $41 to win. He has played in 10 PGA Tour event tournaments so far this season and has already racked up four top 25 finishes and two top 10 finishes. He was fantastic at the WGC-Mexico a few weeks ago, finishing T10 and backed it up with another strong performance at The Players on the weekend with a T16 finish. Bradley ranks pretty well in teh key stats this weekend. 12th in total driving, 21st in shots gained from tee to green and 6th in shots gained on approach. A bet on Bradley to win and a saver on him to finish in the top 10 is our best bet this weekend.